The main objective of dentistry, of course, is to help people keep and maintain healthy teeth for a lifetime. So, when you find out that you need to have a tooth extracted, the news seems almost counterintuitive. Nevertheless, there are circumstances in which removing a tooth really is the best option. 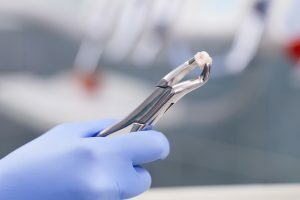 When you or a family member needs tooth extraction in Marietta, you can count on Muskingum Valley Oral Surgery for professional and compassionate care. Read on to learn about the reasons for extracting a tooth. If a tooth is extensively damaged due to severe decay or traumatic injury, your dentist’s first approach will always be to consider ways of saving the tooth. There are fillings and dental crowns, for example. However, if the damage is so severe that these solutions are viable, then tooth extraction in Marietta may be necessary. After Dr. Lee and his staff expertly remove the tooth, you’ll want to return to your general dentist for a tooth replacement such as a bridge, partial denture or dental implant. Wisdom teeth are commonly extracted whether they are impacted—trapped in gum tissue—or they have erupted through the gum. These large teeth are located far back in your mouth, making them difficult to keep clean if they’ve erupted. This can often lead to gum disease or tooth decay. Impacted wisdom teeth may be incorrectly positioned and press against other teeth, causing pain and discomfort. In some instances, wisdom teeth may become infected. As a result, an abscess may develop, causing pain and swelling and threatening the spread of infection. Your orthodontist may recommend tooth extraction prior to putting on braces. More often that not, tooth extraction for orthodontics is necessary to alleviate crowding. In most cases, teeth are removed symmetrically in order to keep your bite balanced. Tooth extraction for orthodontics is sometimes chosen as a simpler alternative to jaw surgery. At Muskingum Valley Oral Surgery, Dr. Lee and his staff perform both non-surgical and surgical tooth extraction. Non-surgical extraction involves the removal of an erupted tooth. The site is anesthetized and then Dr. Lee uses forceps to remove the tooth from the gum. In the case of surgical extraction, the site is once again numbed and sedation from nitrous oxide to general anesthesia is provided. Depending on your particular case, we may only need to remove gum tissue in order extract the tooth. In other circumstances, Dr. Lee may need to section the tooth and remove pieces individually. If you’ve been searching for the “oral surgeon near me,” contact Muskingum Valley Oral Surgery. Dr. Lee and his team expertly perform tooth extraction on patients of all ages.